Professor Dr. Dragan Uskoković’s presenting the results of his recent research on advanced nanocomposite structures for the controlled release of medicaments. All sessions were well-attended, bringing a lively discussion. About twenty posters were exhibited throughout the Conference. An exhibition of equipment, literature and various biomedical devices was staged in the adjacent room. 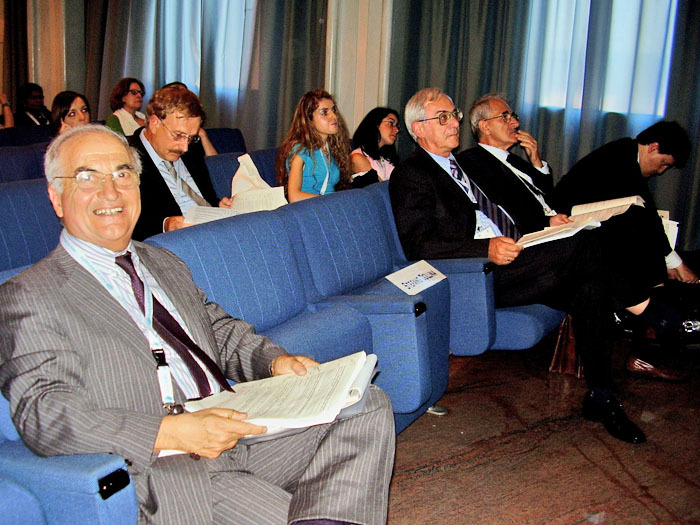 In the first row: Prof. Dr. Dragan Uskoković with Prof. Dr. A. Ravaglioli (left), the President of the Organizing Committee of the 12th CCT Conference and Prof. Dr. R. Cancedda and Prof. Dr. A. Boccaccini, Co-Presidents of the 12th CCT Conference Scientific Committee (right). After the excursion to Ravenna, a ceremonial dinner was organized, during which two young researchers were awarded. 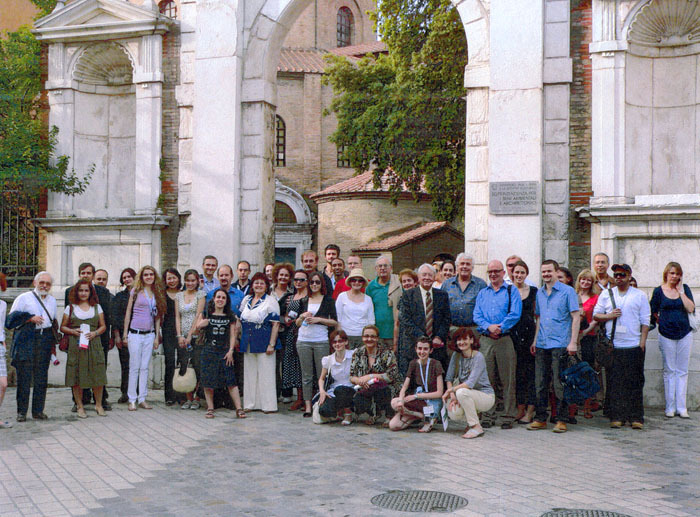 A group of Conference participants during the visit to Dante’s tomb in Ravenna. Standardization, patents and certification of bioceramic materials and devices. 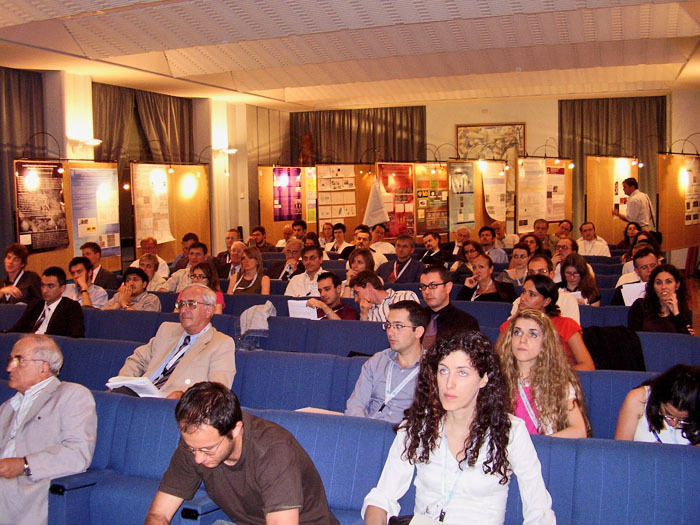 Natural nanotechnology for health: surface-reactive clays and waters (F. Tateo, IGG-CNR-Padova and AISA-onlus). The Round Tables brought very lively and interesting discussions, the full version of which will be included in the conference proceedings. The author of this review gave an invited lecture entitled “Multifunctional micro- and nanocomposites for the controlled release of medicaments” within Session 5: “Biocomposites”. It was met with great interest and was followed by a lively discussion. 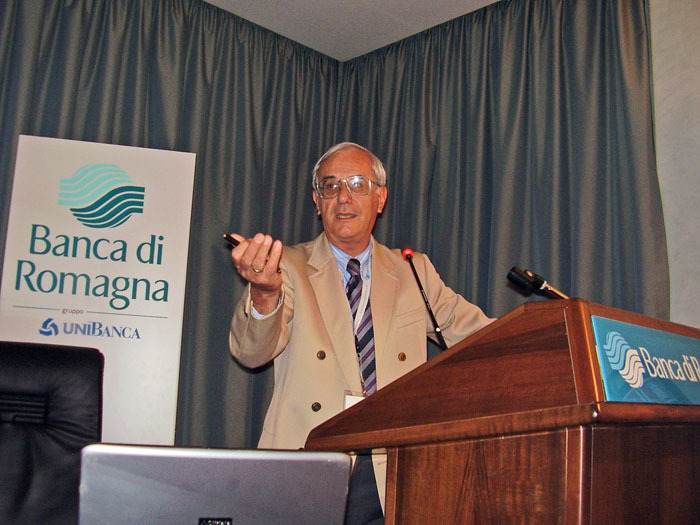 Professor Uskokovic was the chairman of Session 9 “Bioactive glass ceramics”. The conference was accompanied with a varied social programme. The welcoming cocktail was held at the Faenza City Hall (Palazzo del Comune) and it included art exhibition/ competition “Metamorphoses of the human body: mythology, religion and science”. The jury awarded the best works chosen among about a hundred exhibited artworks. On Thursday, on May 21, an excursion to Ravenna was organized for the Conference participants, giving them an opportunity to see the famous monuments of this city (the mausoleum of Theodoric, the Mausoleum of Galla Placidia, San Vitale, Dante’s tomb, etc.). After the excursion, in the evening, a ceremonial dinner was organized, during which two young researchers (one from Italy and one from abroad) were awarded for the best oral presentation. 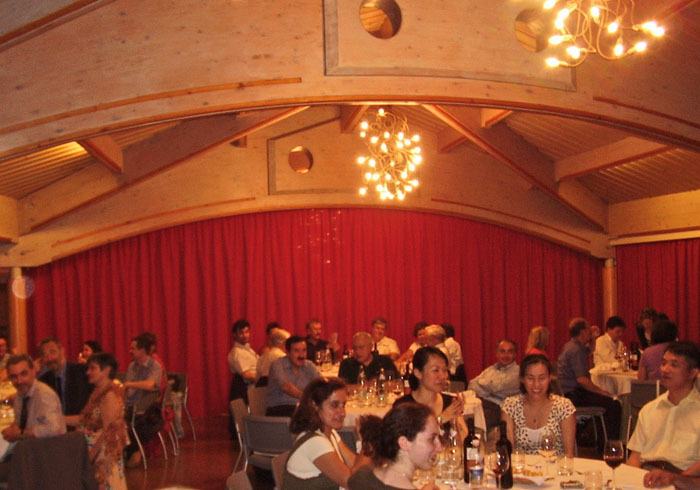 The dinner attendees could also enjoy a lottery with prizes including the proceedings of the previous CCT Conferences and bottled wine produced at the winery of Professor Antonio Ravaglioli. All in all, it was a very successful conference. It offered a great opportunity to participants to get informed on innovative trends in relevant fields and exchange their experiences.